Basically exactly what the title implies. 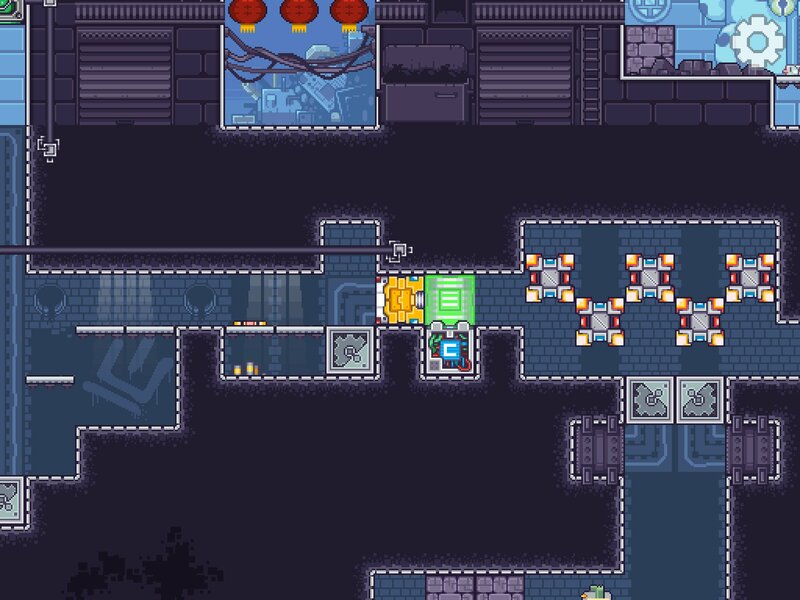 Mobile games seem to do best at crossing one genre with another, and Gunbrick is no exception. Nitrome's level-based platformer is an interesting excursion that mixes up familiar puzzle-solving with the intrigue of a full-bodied action platformer. It's one heck of an interesting ride, but it's over all too soon. Gunbrick places you in the shoes of none other than (you guessed it) a Gunbrick, which is a big cube with guns mounted on it. You navigate each level with it, and you can float to overcome obstacles as well. Depending on what you need to do in the game, you can change the orientation of the weapons and the brick itself, which take a bit of getting used to. If you want to reposition yourself in one direction over another, it will take a bit of practice to orientate yourself. That's why, despite the nature of the game to include the necessity of gunplay, you still have to keep thinking rather than shooting first and asking questions later. There's plenty of reason to question yoru intentions throughout each level, however, and lots of opportunities for you to use your brain rather than good old twitch shooting. There are some difficult puzzles you'll be forced to overcome several times over, which isn't always a picnic. It can also become pretty frustrating as you deal with having to right yourself and figure out which direction to point. What's more, once you've completed the game, that's basically all there is to do. You don't get extra content afterward and there's little in the way of sharing with friends, leaderboards, or social media. Once you exhaust the 36 available levels, that's it. Gunbrick is an interesting endeavor that has its moments, but in the end it's going to be a quick shot of entertainment that you won't get much use out of afterward. It's got a unique art style and different sort of gimmick, but you'll be finished with it much quicker than anticipated.